I heard of dance/movement therapy (and other such therapies) in my early 20's and was fascinated by it. "Dance therapy or dance movement therapy is a form of expressive therapy, the psychotherapeutic use of movement (and dance) for treating emotional, cognitive, social, behavioural and physical conditions." "many forms of dance may be considered an aerobic exercise, and, as such, these forms of dance can bring well known benefits, such as reducing the risk of cardiovascular disease, weight control, stress reduction and bring about other benefits commonly associated with physical fitness. In addition, studies have demonstrated a considerable correlation between dancing and psychological well-being. including "reducing the risk of cardiovascular disease, weight control, stress reduction and bring about other benefits commonly associated with physical fitness. In addition, studies have demonstrated a considerable correlation between dancing and psychological well-being." In fact, a British study demonstrated that Royal Ballet "dancers scored higher than national and international swimmers in seven out of ten areas of fitness." Furthermore, an Italian study "has shown that dance is a very good exercise for heart patients compared to other aerobic exercises like cycling. This may be partly because the patients enjoyed it much more." One of my preferred forms of exercise is dance; however, I haven't danced lately as much as I used to. 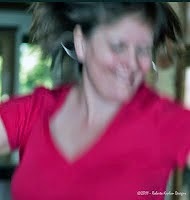 When I do though, I dance oftentimes with wild abandon surrendering to the energy and sounds (beat and rhythm) of music. Especially if the music is electronic or has a steady pulsating rhythmic beat, I might even enter into a meditative state. Yes, you did read that right. There are many ways to meditate and moving meditations such as walking and dancing are two such forms! Do you enjoy dance as a form of aerobic exercise? If so, what kind(s)? *Source of information for this post was supplied by wikipedia (http://en.wikipedia.org/wiki/Dance_and_health). Photo of me dancing by Roberto Kaplan. I used to love dancing, but am afraid I've become far too self-conscious in my later years. Your post has inspired me to remedy that, though - thanks for sharing! I did not know that a meditative state could be achieved while moving. Interesting! I used to love dancing, but injuries to my right leg (knee and ankle) have made it more difficult now. Bopping around to a good rock'n'roll number while doing household chores makes it less boring. ☺ As a child, I took ballet, tap and jazz dancing classes. Dancing for me is also meditative and a spiritual experience. I don't dance any style though I love the cha cha cha. Nice one Elly.